It is important that the patient receives a dose of analgesics after the procedure before the anaesthetic wears off – it will stop the sudden surge of pain caused by the return of sensitivity to the nerves affected by the local anaesthetic. You can expect temporary swelling of the gums in the area of the tooth after the surgery, which can cause slight discomfort. However, after a few days the swelling and discomfort subside. The longevity of the tooth after root end surgery can be both short-term and long-term. If the surgery and associated treatment are performed properly and stem from a correct diagnosis, the tooth can remain attached for a period of many years. You cannot, however, expect it to last as long as a healthy tooth would, or as long as a tooth treated non-invasively would. Root end surgery is most commonly performed on incisors, canine teeth and premolars, rarely on molars. Wherever possible, we prefer the so-called endodontic retreatment of the root canals (repeated root canal treatment), performed through the tooth itself, thus without the need for a surgical procedure. The probability of successful treatment is higher and the longevity of the tooth is longer. We only resort to root end surgery when endodontic retreatment is not possible, or in situations where endodontic treatment has been already performed, yet the infection in the bone persists. The third molars are commonly referred to as wisdom teeth. This colloquialism originated from the fact that the third molars erupt much later in life than other teeth – usually they erupt during the 18th – 24th years of life and there is often not enough space for them to correctly erupt and fit properly into the dental arch. Sometimes the third molar does not erupt at all, in some other cases it erupts horizontally or askew. This condition, where the tooth is unable to properly erupt, can affect any tooth, but it most often happens with the third molars. However, it is true that upper wisdom teeth usually erupt properly and rarely cause complications. The lower wisdom teeth, on the other hand, tend to get impacted, erupt only partially or erupt askew. Undergoing the initial wisdom tooth extraction is the most appropriate before they have fully erupted. The doctor will inspect the tooth by actively touching (with the hands). Afterwards, an X-Ray will be used to identify the precise location of the tooth in the jawbone, its condition and predict its future development. Based on this information, a treatment plan or tooth extraction will be arranged. Impacted wisdom teeth can only be extracted via a surgical procedure. Wisdom tooth extraction consists of applying a local anaesthetic, opening up the gum tissue, removing any bone tissue covering the tooth, extracting the tooth itself, disinfecting the wound and then suturing the wound. In our dental office we perform the wisdom tooth extraction procedure with the utmost care – the alveolar nerve is located directly below, or in the direct vicinity of, the tooth in the jawbone. We make absolutely sure not to damage the nerve during the procedure, because it can cause tingling or insensitivity in the chin and lips. The most common cause of dental tissue damage is tooth decay. It can be caused by bacterial infection, dental plaque or poor oral hygiene. Sometimes it is also conditioned by the quality of dental tissues, which is related to the patient’s health condition and genetic background. What are the types of tooth decay? Depending on the speed of the process, tooth decay may be acute, chronic or stopped. Furthermore, we distinguish between enamel, dentin, and cementum tooth decay, which are hard tooth tissue. While in the case of children, tooth decay especially affects the tooth’s chewing surfaces, in the case of adults it is mainly the so-called interdental caries, which is caused by the non-cleaning of the interdental spaces. Untreated tooth decay leads to tooth marrow damage and, in later stages, to the formation of an infectious bone lesion in the area of the root apex. In the treatment of tooth decay, the rule is the earlier, the better. The treatment of tooth decay is all the more complicated if/when the dental tissue is destroyed. The dentist will determine the appropriate method of tooth decay treatment based on a physical examination. Nowadays, early tooth decay can be treated without the need for “drilling,” by using concentrated fluorides or ozone. Such treatment is absolutely pain-free. Treating the advanced stage of tooth decay consists of removing it by drilling and filling the formed area with a filling or so-called dental filling. However, if tooth decay is at an advanced stage and has reached the dental pulp, it is necessary to treat the tooth’s root canal system. All of these procedures are done painlessly in our dental clinic using local anaesthesia. The type of tooth filling is chosen based on the dentist’s assessment with respect to the patient’s wishes. As a rule, there is a choice between the uncharged, free amalgam and the charged “white” dental filling (composite). Amalgam is the strongest material but has a number of disadvantages such as toxicity (it contains harmful mercury), volume expansion (in cases of insufficient thickness, the tooth wall can be broken), poor adhesive quality (bond to the tooth) and the fact that it is impossible to use in areas visible when you smile. A composite tooth filling is highly aesthetic, has better adhesion quality, and in particular, does not contain mercury. Composite tooth fillings may be chemical or light curable. Light-curing dental fillings (photo composites) make it possible to achieve top-quality results. Chemically curing dental fillings are considered to be of a lesser quality and cannot be colour layered. 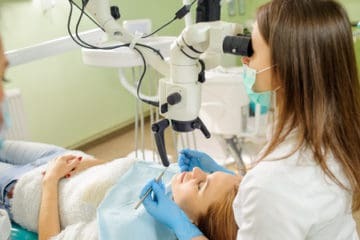 Endodontics is the dental specialty concerned with the study and treatment of dental pulp, which is the living connective tissue filling out the pulp chamber and the root canals of a tooth. Dental pulp is rich in both capillaries and nerve networks, which nurture the tooth and facilitate its growth. Endodontic therapy is most often performed in adult patients. This stems from the fact that dental pulp has barely any regenerative capacity in adulthood. In the event of its death, the connection to the cardiovascular system is severed and the white blood cells therefore cannot stop any potential infections from spreading. Endodontic therapy, in other words root canal treatment, aims to remove infected dental pulp and purify the root canal system to make it possible for it to be hermetically sealed. When is it necessary to undergo endodontic therapy? Endodontic therapy is necessary in the case of any cavities reaching the dental pulp itself. Through high quality root canal treatment, we often succeed in healing the infected dental tissue and thus preserving the tooth. The goal of the entire endodontic therapy procedure is to treat the root canals of the tooth in their entire length, which is measured both through X-ray and digital scanning. The basis of root canal treatment is purifying the infected root tissue and subsequently filling the root canal, which must be sufficiently widened and has had all the infected dental pulp remains removed. This is facilitated through a special disinfection chemical and an endodontic motor. Another important step is the hermetic sealing of the root canal. Most often it is performed by filling the root with gutta-percha points and a special paste (sealer), which solidifies in the root canal over time. This makes the root canal impenetrable by bacteria and infections will no longer be able to enter the centre of the tooth. Root canal treatment is very intensive regarding the equipment, tools and materials used, and at the same time it requires a high degree of dexterity and precision from the dentist. To ensure maximum quality, the procedure is performed with the aid of a dental operating microscope. Due to the need for a clean operating environment, sterile single use instruments are used along with a dental dam, which is a rubber sheet used to isolate the tooth from the rest of the mouth, to prevent the root canal from being contaminated by saliva or blood. Why undergo a high standard procedure? Endodontic treatment through the central point method is a considerably archaic approach. That is why we offer endodontic therapy to our patients exclusively through the condensation method, which is considered to be a high standard procedure, and thus is not covered by health insurance. In our dental office, we make sure to inform our patients of the costs involved in this high standard procedure, which the patients have to cover themselves. 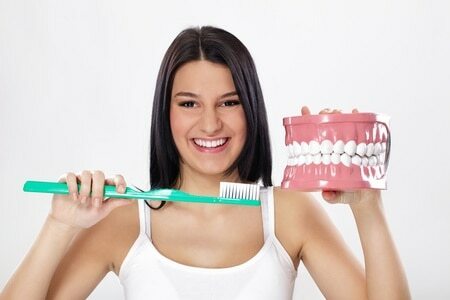 The health of your teeth and gums depends directly on the quality of oral hygiene. Where does tartar build-up and tooth plaque come from? Dental plaque is a soft, sticky, colourless, and to a certain extent, invisible layer on the crown of the tooth. Dental plaque is composed of soft food residue and microorganisms. The presence of bacteria in dental plaque supports the development of tooth decay and gum inflammation. Dental plaque mineralization results in a sediment, called tartar. Controlling the amount of plaque can be straightforward – mechanical and chemical disruption and removal of plaque within oral hygiene or indirect – diet adjustment. Dental hygiene is preventive care performed in a dental clinic that aims to remove tartar, plaque, and other grime. Dental hygiene reduces the number of bacteria in the oral cavity, thus reducing the risk of infection, periodontitis (set of inflammatory diseases affecting the tissues surrounding the teeth) and tooth decay. 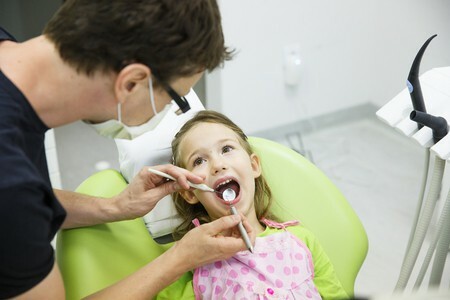 In addition to professional oral care, dental hygiene at SofiDent includes home care training and counselling. How often should dental hygiene be done? Dental hygiene should be done at least once every 6 months, at least twice a year. Classic tooth cleaning, even with the use of dental floss and interdental brushes, is not enough. A patient is usually not able to easily get to the back teeth at home. Therefore, as a general rule, it is necessary to undergo dental hygiene every six months, where all interdental deposits might be removed. How does dental hygiene work? Dental hygiene takes place in several stages. 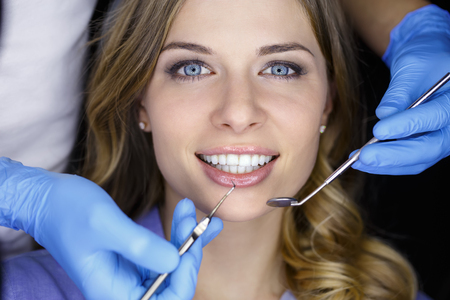 First, the dental hygienist performs an initial examination of your oral cavity. This is followed by the tooth cleaning phase, during which the tartar and dental plaque are removed from the surface of the teeth. If your gums do not bleed, the cleaning is performed using manual instruments or by ultrasonic scaling instruments. After the teeth are cleaned, they are further polished using a rotating polishing device. A protective paste is used to make your teeth polished and smooth. To reinforce the tooth enamel, fluoride is applied. Finally, the correct tooth cleaning technique and the necessary instruments will be explained. The whole process usually takes 60 minutes. If your dental hygienist discovers that your gums are inflamed and bleed, or that your dental pockets are deeper than 3 mm and you have exposed tooth roots, you will need special care. Dental hygiene is then performed on sections of the denture and is more time-consuming. What is tooth sandblasting (AirFlow)? AirFlow is a widespread mechanical dental cleaning method in dental hygiene. This is a gentle removal of tartar and dental plaque, even in heavily cleanable interdental spaces. The AirFlow principle is based on a focused jet of compressed air, water, and bicarbonate particles to gently polish away any surface staining from the teeth. AirFlow is a painless method. The responsibility for the child’s teeth is usually borne by their parents. It is very important not only to regularly visit the dentist, but also to teach children how correctly take care of their teeth and oral cavity. Proper care of the oral cavity from the child’s birth can prevent the development and subsequent treatment of tooth decay. Our dental hygienists and our dentist, who is focused on paediatric dentistry, will tell you about the principles of prevention of tooth decay and child tooth care. They will be happy to provide you with information on proper nutrition, hygiene, fluoridation and how to remove various bad children´s habits. Digital panoramic X-ray OPG (orthopantomogram). Detailed digital RVG images, eventually Bite-wing images for control of interdental spaces and spaces under the back teeth fillings. Detailed examination of teeth and gums with magnifying glasses, eventually intraoral cameras. Assessment of the quality of existing fillings and determining the level of the child’s dental hygiene. Assessment of the position of teeth and jaws within orthodontic prevention. If necessary, preparing a treatment plan with the cooperation of parents. What is a fissure? It is a small groove in the tooth. Therefore, bacteria can get inside. These grooves are located predominantly on the chewing surfaces of the back teeth and premolars. Fissure sealing is a preventive procedure that is mostly done in children to protect freshly cut teeth before tooth decay develops. The ideal time for sealing is the period as soon as possible after the cutting of the tooth. At that time, there are not so many bacteria, which cause tooth decay, in the grooves, and therefore sealing has the greatest chance of long-term success in paediatric dentistry. The sites most prone to tooth decay are covered with a special sealing material that closes access to these difficult to clean parts of the tooth to dangerous bacteria. Any performance (from tooth decay removal to dental hygiene) can be performed in analgosedation, which is sedative analgesic anaesthesia. While general anaesthesia means that the child completely falls asleep, analgosedation causes insensitivity and the brain stops perceiving pain. Small patients in this state can breathe themselves while they sleep but they do not remember the treatment process. In analgosedation, we use a safe and effective inhaled analgesia, Entonox, known as “laughing gas”, which has the necessary rapid onset and offset of effect. Periodontology concerns itself with treating and preserving the tissues responsible for providing support for your teeth and ensuring they remain firmly anchored to the jawbone. The professional term for these tissues is periodontium. Periodontal diseases are the second most common cause of tooth loss after cavities. Is it a matter of genetics? Periodontal diseases primarily form as a result of long term dental plaque and calculus build-up. In other words, there are no genetic predispositions at play; the main factor is insufficient oral hygiene. A contributing factor towards plaque build-up can also be overhanging dental restorations and crown edges. How can I identify a periodontal disease? The main symptoms of periodontal diseases are bleeding gums and bad breath. Dental plaque contains bacteria which produce a number of toxins which irritate the gums. Red and swollen gums signal an infection. Gums that remain swollen for a longer period of time react to any mechanical stimulus. Periodontium loss manifests first through gum recession, then the formation of periodontal pockets, and in the final stage by exposed tooth roots. Gum recession causes temperature sensitivity in teeth. Pockets are caused by the space between the gums and the teeth deepening. Bad breath is caused both by bacteria and periodontal pockets, which serve as a reservoir for food remains to build-up in. Affected teeth can start to loosen, and if you do not start to remedy the situation, the teeth will have a minimal chance of remaining attached. Both periodontitis and periodontosis are periodontal diseases. Periodontosis shares many symptoms with periodontitis. Just like with periodontitis, periodontal pockets are created and teeth begin to loosen, yet infection is not amongst its medical signs. We are able to cure peridontal diseases, but the most important aspect of the treatment is perfect oral hygiene, which not only includes the use of a toothbrush, but interdental brushing and flossing as well. During periodontal disease treatment, we employ a wide range of supplements which can greatly aid the treatment. The supplements include chlorhexidine mouthwashes, gels and bacteria suppressing toothpastes. The goal of the treatment is to return the affected tooth surroundings, primarily the gums and the jawbone, to their original condition. This can be fully attained only in the case of a gum infection (Gingivitis). In the case of periodontitis and periodontosis, the loss of tissue tends to be permanent – in that case the primary goal is to stop the disease from advancing. We divide periodontal disease treatment into multiple phases, which do not necessarily have to follow a linear progression (it is commonplace to take the patient from the Initial therapy phase directly into the maintenance phase without any surgical procedures). The goal of the initial therapy is to remove any gum infection, and to create and maintain a plaque and calculus-free oral environment. After the initial oral hygiene procedures, we will explain the correct ways to take care of your teeth to you. Correct and regular oral hygiene is a necessity for further treatment. If the initial therapy proves to be ineffective and the disease cannot be stopped, it is appropriate to employ surgical treatment. There are different types of surgical procedures, all of which share the same goal – to reduce the depth of the periodontal pockets, remove infection, secure the loosened teeth and stop the dental plaque from building up (thus preventing any calculus from forming). The amount of visits needed depends on the number of affected teeth and the extent of the disease. Our patients usually require about 6-12 visits. This phase is the last step in periodontal disease treatment. Its goal is to maintain the healthy condition where the gums show no signs of infection or bleeding, the teeth are cavity and calculus-free, and devoid of any improperly fixed bridges, restorations or implants, which could serve as places for plaque to build up or irritate the gums. Depending on your condition, the dentist will create a schedule for you, which could be potentially time consuming in the initial months. During each visit, the quality of your oral hygiene along with the amount of any potential gum bleeding will be assessed, and your teeth will be professionally cleaned. If the condition does not begin to worsen, you will be able to visit the dentist only twice a year. 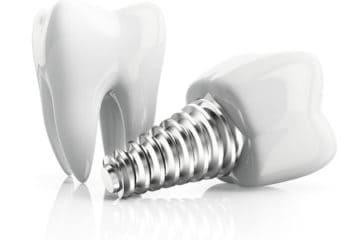 Dental implants are artificial replacements for missing teeth created from titanium, or alternatively from a titanium alloy, which are placed directly into the jawbone similar to the root of a natural tooth. Most often they come in the shape of a screw or a cylinder. The majority of the implant lies hidden in the jawbone (fixture). A connecting element (abutment) is fixed onto the top of the visible part, which forms the foundation for a future replacement tooth – a crown, a bridge or a complete prosthesis. Dental implants have a life expectancy of decades and are not only considered to be a long-term solution, but also comfortable and aesthetically flawless. Their use is not limited by the patient’s age and replacement is possible even for children, if their bones are developed enough. Unlike with dentures, implants eliminate the need to involve healthy adjacent teeth and they involve the jawbone in activities it was used to performing before tooth loss. Dental implants can be placed both into a fresh socket after a recently removed tooth and into a jawbone which has been missing teeth for a period of time. One of the main advantages of dental implants is the option to fit them immediately after extracting a tooth. How is the placement of a dental implant performed? The procedure is usually performed in two stages. In the first stage a small incision is made in the gum where the implant will be placed. A hole is drilled in the bone, the implant is placed into the hole in the bone, and the incision is stitched closed, either with absorbable sutures (do not have to be removed) or non-absorbable (need to be removed in 7-10 days). The implant is placed with the aid of a local anaesthetic or under analgosedation. Then the implant is left to heal – so the surrounding tissue covers it entirely. In the upper jaw this process usually takes 6 months, in the lower jaw 3 to 4 months. This healing period is followed by a second surgical procedure that involves making a new incision to expose the implant. A collar is screwed onto the top of the implant. It helps the surrounding gum tissue to heal. During a two week period, protective tissue will form around the collar to serve as protection against microbial infection. Afterwards, the collar is replaced with the abutment and a replacement tooth can attached onto the top – a crown, a bridge or a complete prosthesis. Crowns are usually attached several months after the fixture is implanted. Sometimes a temporary crown is attached before the permanent attachment is performed. When replacing multiple dysfunctional teeth or performing a toothless jaw reconstruction, bridges are screwed into the bone after implanting the fixtures. In certain cases the healing period can be skipped and the replacement tooth can be attached immediately. The end of the procedure is accompanied with minor pain, which is usually the most intense after the anaesthetic wears off and lasts about three days. You can expect your face to swell and ache. Minor bleeding and stiffness in the chewing muscles can also occur, which can prevent the mouth from opening. It is recommended to use an icepack on the affected areas of the face. Our doctors will also prescribe you pain relief medication. A soft food diet needs to be maintained during the first days after the procedure. You should avoid hot beverages and meals. It is important to note that smoking increases the risk of complications and significantly increases the healing time. 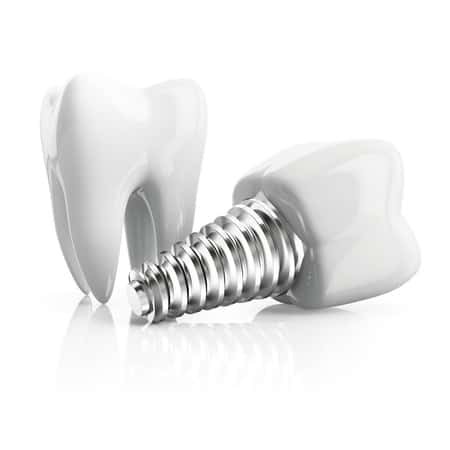 The artificial dental implant can be used after the initial time necessary to heal the wounds. The implants will allow you to eat normally and socialise without worrying about your teeth. Caring for the dental implants is the same as you would for your natural teeth. Amongst the possible complications tied to placing the dental implants are wound infections, sinus problems etc. However, if the patient interested in a dental implant is not a heavy smoker, does not suffer from a major metabolic disorder or diabetes, is not undergoing radiation treatment, does not have insufficient oral hygiene and has sufficient bone tissue, the procedure should be carried out with no major complications. The risk that the body would reject the implants is usually negligible. To lessen the pain during this surgical procedure, it is usually done with the aid of a local anaesthetic. In the case of the upper teeth, only the area of the tooth needs to be anesthetised, whereas the lower teeth require inferior alveolar nerve anaesthesia. 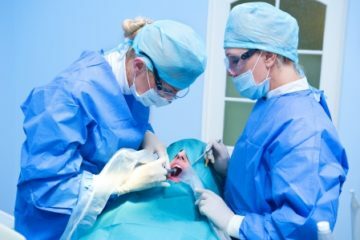 Immediately after the procedure, you will be given a gauze pad which you will have to bite on gently to stop the bleeding. The pad has to remain in the mouth for at least 15 minutes. To lessen the post-surgical pain or potential swelling, it is appropriate to take an over-the-counter analgesic before the anaesthetics wear off and then apply an icepack on the affected areas of the face. During the first two days, do not rinse the oral cavity and do not gargle, so you do not interrupt the formation of the blood clot over the wound – it is necessary for a complication–free healing process. After the first two days, it is recommended to start rinsing the mouth with herbal extracts (for example agrimony, sage or camomile) or alcohol-free mouthwashes (for example Corsodyl, Paroex, Curasept). If you still have the sutures in, eat soft foods and use the other side of the mouth to bite, so the stitches do not tear. We will remove the stitches usually 7-10 days after the surgery. Beautiful white teeth will surely give your face a healthier and a more attractive look. An easy way to attain a glistening smile is by undergoing a tooth whitening procedure at our dental office in Prague 5. 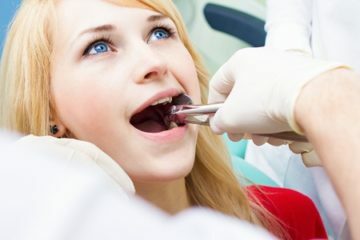 Can I undergo a tooth whitening procedure? Only permanent teeth can be whitened. The teeth need to be healthy, rehabilitated and with no signs of gum infection. Tetracycline stained teeth, or teeth suffering from fluorosis, can only be whitened with the permission of the patient’s dentist. The patient has to be in good health at the time of the tooth whitening procedure. Future mothers should be aware of the fact that undergoing a tooth whitening procedure is not recommended during pregnancy. What are the tooth whitening methods used? There are two possible tooth whitening variants – in-office whitening and at-home whitening. 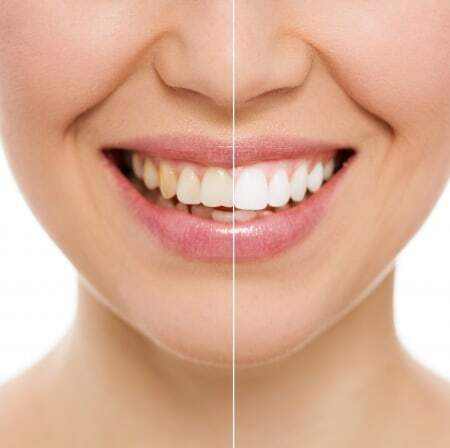 During in-office tooth whitening, a highly concentrated whitening solution is used, which makes this tooth whitening method much faster and more efficient. However, it is important to be aware of the fact that the sought after result will not necessarily be achieved after the first session. In the case of strongly stained teeth staining, the procedure will need to be repeated. At-home whitening is slower, yet less costly. A less concentrated solution is applied to the teeth through special trays that are left on for 1-2 hours during the day, or for the duration of a night’s sleep. An at-home whitening cycle usually spans 2 weeks, but very strongly stained teeth can require up to 8 weeks of at-home whitening. Which tooth whitening method should you choose? It is a very individual matter, which depends on multiple variables. The most important factors are the cause of tooth discoloration, its extent, intensity and the severity of tooth sensitivity. Last but not least, your time and financial options are also a factor. 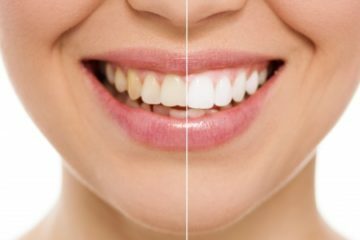 What are the phases of in-office whitening? Before undergoing any tooth whitening procedure, it is recommended to visit a dental hygienist, who will remove all plaque and calculus from your teeth. In-office tooth whitening then has two phases – preparation and the whitening procedure itself. The goal of the first phase is to cover all soft tissue with cotton pads and protective gel. The soft tissue must not come in contact with the whitening paste, as it contains carbamide peroxide / hydrogen peroxide. The whitening phase itself takes 15 minutes. First, the dentist applies the whitening paste to the teeth. Then he puts protective goggles on the patient and turns on a plasma UV lamp to speed up the whitening process. After the specified amount of time passes, the dentist removes the paste completely and cleans the teeth. This procedure is repeated as needed. What should be avoided after undergoing a tooth whitening procedure? After a tooth whitening procedure, you can experience increased tooth sensitivity. You should avoid temperature extremes (mostly cold and hot beverages). This increase in sensitivity is only temporary and usually lasts less than two days. To prevent any resurgence of tooth discoloration, you should avoid food and beverages containing strong food coloring. These are mainly: beetroot, raspberries, blueberries, red wine, coffee, tea etc. Smokers should refrain from smoking. After a period of two weeks, the whitening effect will completely stabilize and you will be able to return to your regular lifestyle.